The election commission of India has started to enroll new voters and updation of existing electoral database both offline and online. Now a person who wants his/her name for inclusion in the voters list can do so at the click of a mouse and filling up form online. The Election Commission of India has a dedicated portal for the same. The website URL is www.nvsp.in . A person can apply for inclusion of his/her name in the electoral list and also get Voter ID card delivered to his doorstep with this process by filling up the form and uploading of scanned copies of required documents/certificates with relation to Address Proof/Date of Birth etc. in the portal. Please see the steps below for applying of Voter ID online. 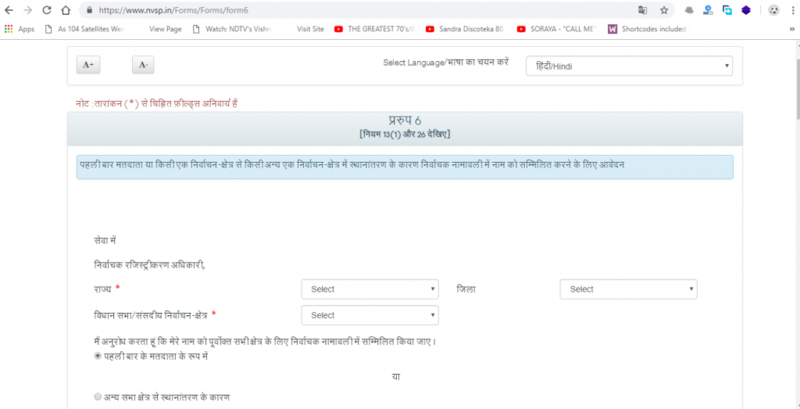 Click the icon containing text – Apply online for registration of new voter/due to shifting from AC. A page titled Form 6 will appear, fill the details and Click Submit button at the end of the page. After verification, your name would be included in the voters list of the choice of your constituency and the Voter ID card would be delivered to your address that you mentioned as proof and in the form.